Join Leica Gallery Los Angeles and multimedia artist and ex-medical doctor, Norman Seeff in his upcoming exhibition featuring never-before-seen images of Joni Mitchell shot in Seeff's Sunset Boulevard studio, set to coincide with the launch of Seeff's book to celebrate Mitchell's 75th birthday. Seeff uses documentary filmmaking and conversations with artists in the context of the session as vehicles to explore the creative process from the inside out. His approach is to focus on the relationship with the artist to create spontaneous experiences in the moment and capture images that are alive and real. Seeff began filming his photo-sessions in 1975 and has to date documented over 600 sessions with artists and innovators of all major disciplines in the act of creation. 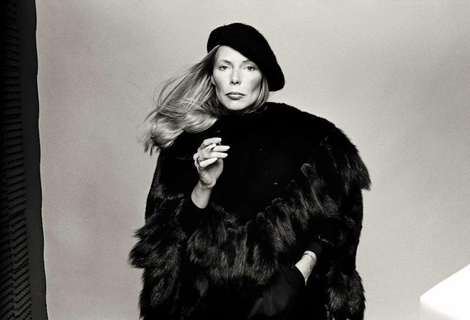 In addition to iconic shots of rock stars, actors and public personalities, Norman Seeff's upcoming exhibition at the Leica Gallery LA will feature images that have not been seen previously from 12 sessions with Joni Mitchell. Shot in Seeff's Sunset Blvd studio (recently known as the Bar Marmont) and Joni's house in Bel Air, these are featured in the book Seeff is releasing to celebrate Mitchell's 75th birthday. Lovers of Mitchell's music will be familiar with Seeff's shots from her albums "Court & Spark", "Hejira", "Hissing of Summer Lawns", "Don Juan's Reckless Daughter", "Dog Eat Dog" and the compilation albums "Hits" and "Misses". As he was designing the book, Seeff discovered a renewed respect for Joni as a Boundary Dweller innovative creator. His revelations became the theme of the book's text. Join Norman for an intimate discussion and book signing of Joni- The Joni Mitchell Sessions featuring insights from 12 sessions with Joni Mitchell from 1972-1985, and is timed to celebrate the legendary artists's 75th birthday on November 7, 2018.